Nicknamed “tin cans” or “greyhounds,” destroyers are quick naval ships used to defend larger battleships—and they have proved indispensable in America's military victories. This action-packed narrative history of destroyer-class ships begins with destroyers’ first incarnation as torpedo boats in 1898 through the last true combat service of the ships in the Vietnam War. With vivid immediacy, author Clint Johnson brings us inside the quarter-inch hulls of destroyers to meet the men who manned the ships’ five-inch guns as they fought America's wars from inside, risking death by cannon shell, shrapnel, bomb, fire, drowning, exposure, and sharks. 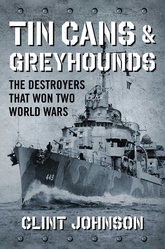 Tin Cans and Greyhounds is the definitive guide to one of America’s essential naval weapons.